Every Jewish woman should have a noodle kugel, brisket, and matzo ball soup in her arsenal. These dishes go a long way toward filling the table with nostalgic, traditional holiday dishes. My mom and aunts all made the same noodle kugel recipe for most holidays. It was the star of the meal as far as I was concerned. 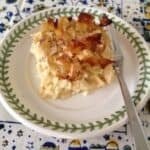 I like the sweet kugel, which is a dish of egg noodles coated in a luscious, sweet dairy sauce and held together by eggs. Kugel is comfort food at its best and a special holiday treat.